Nanopipe is a library that allows you to connect different messaging queue systems (but not limited to) together. Nanopipe was built to avoid the glue code between different types of communication protocols/channels that is very common nowadays. The development of Nanopipe is still going on and we hope to get help from community to improve it, to implement more sources/sends. There are still many item on our roadmap such as a textual (or yaml, etc) DSL for describing the connection graphs and also a command-line utility to use the library in order to avoid the use of the C++ library itself. Visit the Nanopipe Github repository for sources, issues, etc. Sources: the sources are producers of messages, they will connect to a source of message and then they will deliver these messages to the sends. Sends: the sends (or senders) will consume the messages delivered by the sources to another (or even the same) messaging broker. Note that you can have Sources and Sends that aren’t strictly message queues. You can have for instance a send that will call a HTTP/HTTPS REST API upon receiving a message from a source. Every source/send will run on its own thread, which means that the receiving of messages on a source will not impact performance on another source or send. 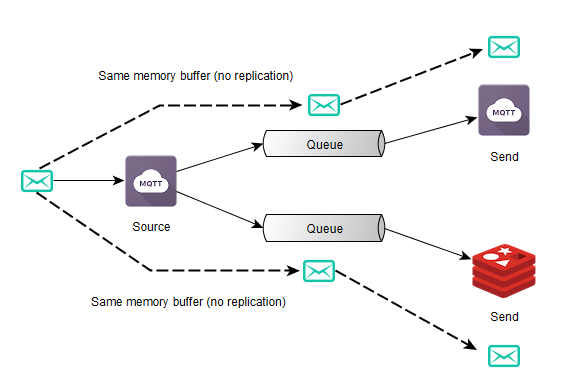 Internally, Nanopipe uses a producer/consumer queue with very low synchronization requirements in order to exchange messages between sources and sends (you can also control the size of this internal message queue). This internal message queue will be instantiated for every source/send connection, so Nanopipe will have a different message queue for each source/send connection, however the message delivered by one source is shared between all its sends. This section describe how to install Nanopipe. Nanopipe uses some bleeding edge version of some of the libraries above. Some distributions (such as Ubuntu) has packages only for older versions of these libraries, so install them using source. This section describes how to use the library and also shows some examples using the C++ API. Bindings for Python will be developed in near future. If you are interested in contributing, let us know. Here is an example of an application using the Nanopipe library for you to get a taste on how to declare the sources/sends using different systems. This application will execute, wait for 10 seconds and then it will stop all source/send threads. The MQTT Source and Send implemented on Nanopipe is based on Mosquitto library. Here is an use case example where we want to get messages from a MQTT broker and then publish them on Redis. You can test this example application using the HiveMQ MQTT broker where you can use your browser to connect and publish on their broker. You’ll also need a Redis server instance running. As you can see, the example is very simple and intuitive. We first instantiate the source and the send and then we just connect both before starting our manager, that will be responsible for executing the graph. 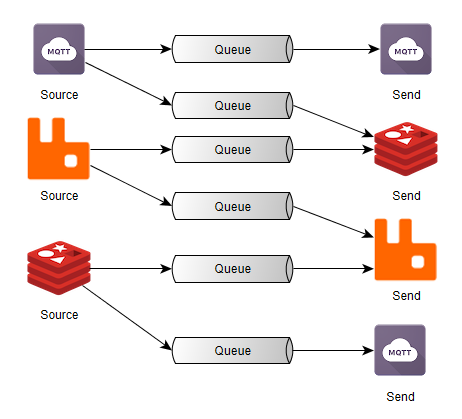 Every message published on the topic wstopic on the MQTT broker will be sent to the Redis topic wstopic. Everything without struggling to write glue code.